Dr. Mizrahi will review 20 years of research to unravel connectivity in Semipalmated Sandpipers populations throughout the annual cycle and determine what factors during the winter, migration and breeding periods underlie significant declines in populations, especially those migrating through the Western Atlantic region. He will also discuss conservation efforts that address several of the major stressors these populations are experiencing. Dr. David Mizrahi earned his PhD in Zoology at Clemson University under the direction of Dr. Sidney Gauthreaux. His dissertation research focused on the ecology, physiology and behavior of Least and Semiplamated Sandpipers during spring migration staging periods in Delaware Bay. 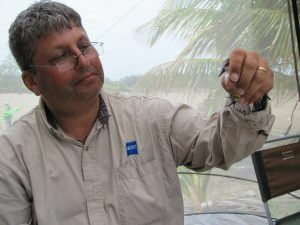 Since 1999 he has held the position of Vice-president for Research and Monitoring at New Jersey Audubon. Under his direction, the department has become a leader in the conservation of migratory birds. Many of the department’s projects are regional in scope and in some cases, international. Research and Monitoring staff is currently working on projects to conserve young forest habitats used by conservation concern species like Golden-winged Warbler and Prairie Warbler, assess the status of Black Rail populations in New Jersey, restore habitats for beach nesting birds like Piping Plover and American Oystercatcher. Dr. Mizrahi’s area of expertise is the ecology and conservation of shorebirds with a primary focus on Semipalmated Sandpipers and other shorebird species that winter in northern South America and migrate through the western Atlantic region. Since 1995, he has conducted important research on the ecology and behavior of shorebirds using soft-sediment habitats in Delaware Bay, including investigating the relationship between horseshoe crab egg availability and weight gain potential in Semipalmated Sandpipers, relationships between habitat use and foraging strategies, and migration phenology and connectivity using nanotag technology. In 2008, he initiated a comprehensive shorebird research and conservation program in northeastern South America with partners in Suriname, French Guiana and Brazil. This includes work on spatial relationships between wintering, migrating and breeding populations using remote sensing techniques and stable isotopes, habitat use and foraging behavior, physiological preparation for northward migration, the impacts of shrimp aquaculture on foraging behavior and contaminants exposure, and addressing illegal and unregulated shorebird hunting in the region. His current research endeavors to develop apparent winter survival estimates for Semipalmated Sandpipers in the northern region of South America and use these and similar data from migration staging and breeding areas to develop a full life-cycle, migration network model that helps to focus conservation strategies for the species.